Happy Friday everyone, can you believe another week has whizzed by and it's almost the weekend again. Olivia, if you're reading this, loved our chat this morning and I did come home, grab a coffee and get bloggin' no G lol!!! (A Radio 2 Friday thing if you're a listener). Last weekend I was invited along to host a workshop as the celebrity guest at the UK Stampers Network 20th Anniversary event down in Bicester. Mickey, thanks so much for the invite and ladies it was great to meet you all. What a fab anniversary event it was. 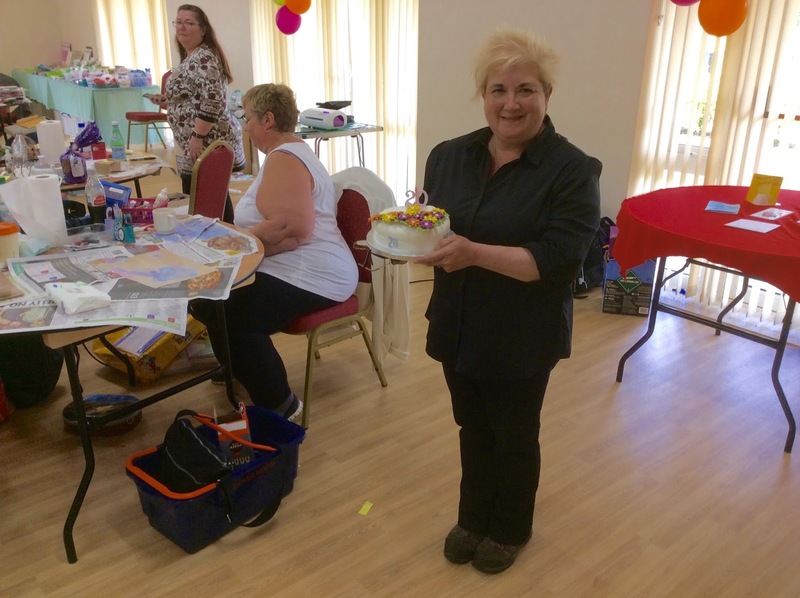 Lots of creative workshops, oodles of cake, fab chit chat and a really tasty Chinese too. Here's Mickey, the founder of the UK Stampers Network holding the Anniversary cake - it was soooooo tasty.. If you're coming along to the Dare To Create Event in Coventry next weekend and fancy making this little notebook do book onto the make and take sessions with Di when you get to the event on Saturday. Well, Harry tells me he's coming home for the summer proper on Sunday - note to self ......... don't forget to drive to Cheltenham with an empty car!!!! Looks like you all had great fun. Love the design on these little books. I love these little books Clare and the ladies did a fab job on them and they all looked so happy and pleased with their creations!!!! Oh boy I don't envy you bringing Harry home with all his things you will think it has multiplied!!! Lol, hope it doesn't rain for you!! Take care, thanks for the inspiration as always!!! Lovely work, well done everyone. Morning Clare, Haha, I was chuckling at your mention of the 'empty car' haha. Wow !! 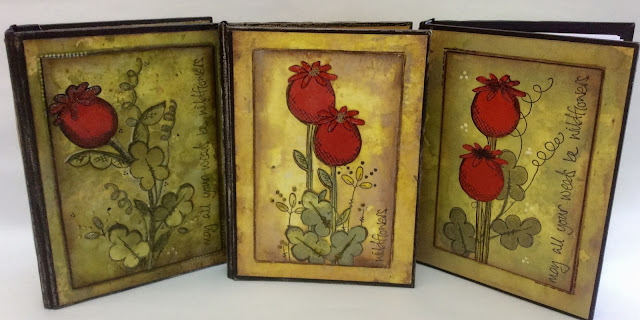 these notebooks are stunning, I'm loving the stamp plate used, and all the samples are stunning, well done ladies ! !